The early roots of this line of Jacksons in Co. Down – presuming there are earlier roots to be found in Co. Down – may be connected to the James JACKSON of Ballymiscaw, Parish of Dundonald. 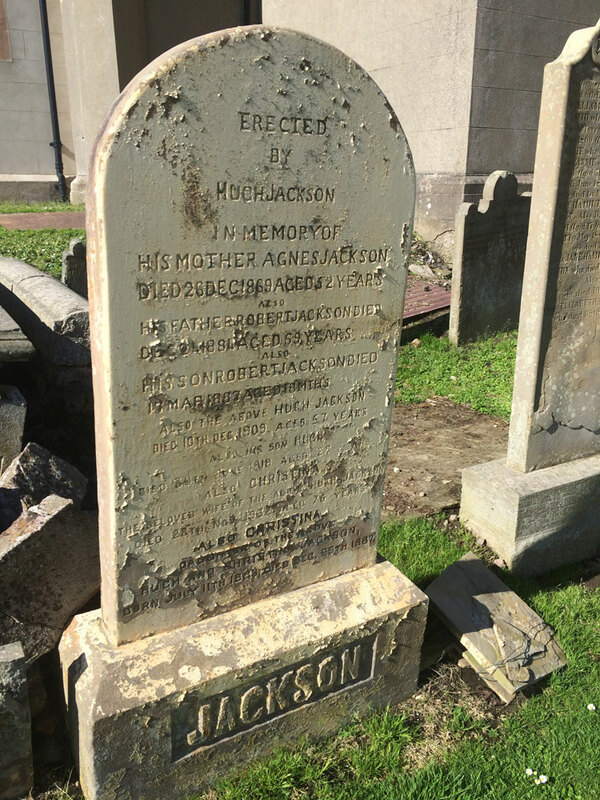 That James JACKSON was a son of Gilbert JACKSON, and his likely dates would make him to be in the right time frame to be a grandfather of Robert Jackson (1815-1884) beneath. The tree for that line of JACKSONs is at The Jacksons of Co. Down. The names and dates are all based on evidence prepared for Oinri Jackson. Sources are available on request. Update: July 24, 2018 NOTE: Oinri JACKSON has a more complete version at Ancestry including more of the descendants of William James JACKSON. Photo property of Oinri Jackson. 2 Robert JACKSON b: 1815 c: 20 Mar 1815 d: 24 Dec 1884 NOTE: According to his baptismal records, his father was a James JACKSON. His daughter-in-law Christina was present at his death. He died after 21 days of Bronchitis at 4 Dunne Street, Belfast. He was a bread server. 3 John JACKSON b: Abt 1843 d: Aft 1911. In the 1901 census, he was age 58, Baptist, carpenter. He lived at Summerwood, Clifton, Shankhill, Belfast in a single house. The walls were of brick, stone, or concrete, the roof was slate iron or tiles, and with seven rooms for three people, this would seem to be a comfortable dwelling house. His son John was the only one still living with him and his wife. + James Mahood HUGHES I suspect he was the James M. Hughes, age 29, in the 1911 census who was a ship builder.